CHARM SPIRIT (IRE) (Bay 2011-Stud GB 2015, NZ 2015). 6 wins-1 at 2-from 1400m to 1600m, Ascot Queen Elizabeth II S., Gr.1, Prix du Moulin de Longchamp, Gr.1, Chantilly Prix Jean Prat, Gr.1, Prix Paul de Moussac, Gr.3, Maisons-Laffitte Prix Djebel, Gr.3, Longchamp Prix des Melezes, 3d Longchamp Prix Jean-Luc Lagardere, Gr.1. Grandson of a half-sister to SW Russian Bond. His oldest NZ-bred progeny are yearlings. ROXON, by Postponed. 5 wins from 1200m to 1600m, NZ$110,925, WRC Anniversary H., L, Marton JC Waikato Stud H., Levin RC The Chronicle H., Manawatu RC Gravity Canyon Adventure H., 2d WRC Thompson H., Gr.3. This is her fourth foal. Dam of one foal to race. ROXON (Postponed). 5 wins. See above. Dont Gloat. 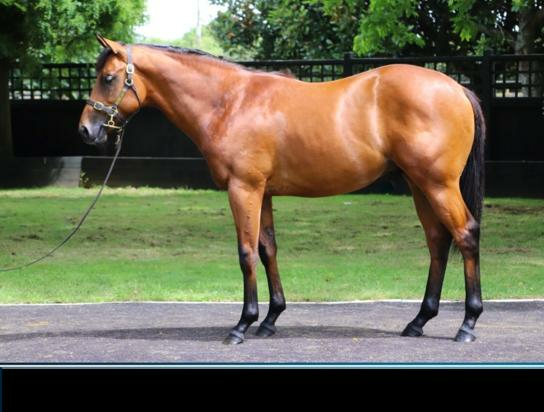 5 wins at 1200m, 1400m, Manawatu RC Harcourts H., Taranaki RC Waterfront Hotel H., Waikato RC Fairview Motors H., 2d Waikato RC Race a Horse With Te Akau H., Taranaki RC Hermes Syndication H., 3d Manawatu RC Crombie Lockwood H., Silvester Clark H.
King Usain. 3 wins from 1200m to 1600m, A$88,610, SAJC Happy 60th Dianne Smith H., 2d ATC Australia's Favourite Air H., MVRC Globalgallop.com.au H., SAJC Hylands Race Colours H., 3d SAJC Crows Foundation H., Schweppes H.
Balbowa. Winner at 1400m, WATC Perth Ice Works H., 2d WATC Magic Millions H., Magnifisio Sold at Magic Millions H.
Coleman. Winner at 1000m, 2d SAJC SA Bookmakers H.
DELIGHTFUL (Omnicorp). 6 wins. See above. Lightning Lass. 4 wins at 1600m, 2000m, Manawatu RC Let's Go to Icons H., 2d Wairoa Cup, Manawatu RC Tegel Rashers H., Support the Arohanui Hospice H. Producer. RECALL (Kaapstad). 5 wins from 1350m to 2400m, A$156,150, STC Winter Cup, L, 2d STC Frank Underwood Cup, L, Lord Mayor's Cup, L, 3d STC WJ McKell Cup, L.
AMBITIOUS DRAGON (Pins). Horse of the Year in Hong Kong in 2010-11 & 2011-12. Champion Middle Distance Horse in Hong Kong in 2010-11 & 2011-12. Champion Miler in Hong Kong in 2011-12 & 2012-13. 13 wins from 1400m to 2000m, HK$58,722,850, HKJC Audemars Piguet Queen Elizabeth II Cup, Gr.1, Longines Hong Kong Mile, Gr.1, Mercedes-Benz Hong Kong Derby, L, Citibank Hong Kong Gold Cup, L, Mercedes-Benz Hong Kong Classic Cup, L, Stewards' Cup, L, Queen's Silver Jubilee Cup, L, Oriental Watch Sha Tin Trophy, L, National Day Cup, L, 2d HKJC Cathay Pacific Jockey Club Mile, Gr.2-twice, Standard Chartered Champions & Chater Cup, L, 3d HKJC BOCHK Wealth Management Jockey Club Mile, Gr.2. NEEDUASK - ACE ALETA (Sing.) (Howbaddouwantit). 6 wins to 1400m, NZ$227,375, S$219,993, Avondale JC Concorde H., Gr.2, ARC Newmarket H., L, Lindauer Special Reserve Cuvee Riche H., Herald on Sunday H., BOP RC Ultimate Motor Group Ford 3YO H., 2d ARC Railway H., Gr.1, Singapore Derby Trial, L, Singapore TC Patrons' Bowl, L.
SALAMANCA (Alamosa). 9 wins-2 at 2-to 1400m, NZ$206,450, to 2016-17, CJC Champagne S., L, 3d Rotorua RC Arawa S., Gr.3. JOKER EXPRESS (Sakura Seeking). 6 wins to 1400m in Malaysia, Penang TC Dr Lim Ah Soo Memorial Trophy, L, 4th Perak TC Sultan Gold Vase, L.